One of Hendricks County, Indiana&apos;s premier destinations is celebrating its 15th anniversary this year, and there is no better time to visit McCloud Nature Park. Nestled in the northwest corner of the county, just outside of North Salem, McCloud Nature Park can be summed up as a 232-acre slice of natural heaven. One of my favorite attractions long before I began working for Hendricks County Parks & Recreation, I&apos;d like to share some tips with you on enjoying the park the way I do. Located at 8518 Hughes Road, McCloud Nature Park is open daily from dawn to dusk, and there is never any admission fee to visit. Leashed dogs are welcome. The park boasts 6.5 miles of trails, Big Walnut Creek, a restored iron truss bridge that is over 100 years old, a Nature Center, an observable honeybee habitat, a wetland habitat that includes a boardwalk and observation deck and all sorts of plants and wildlife. Visitors often see bald eagles soaring through McCloud Nature Park. Plenty of picnic tables and a pavilion that will shield your family from the sun provides a nice picnic spot. The Nature Center offers modern restrooms as well as a water station that includes a doggie drinking fountain. Speaking of the Nature Center, you definitely should explore it at McCloud Nature Park. It&apos;s open from 10 a.m. to 4 p.m. Wednesdays through Saturdays and from 1 to 4 p.m. on Sundays and is always free. Inside the Nature Center, interactive exhibits educate visitors about the native plants and animals that make McCloud Nature Park their home. Its features include a bird-viewing room, a library of nature-related resources, local artwork on display, two resident turtles, a resident black rat snake and a bevy of helpful and friendly park naturalists. The naturalists at McCloud Nature Park host weekly family programming, most of which is free, and all of which is fun and educational. For programming that requires advance registration, the fees are very low, so attending a program at McCloud Nature Park remains within anyone&apos;s budget. A free Astronomy program takes place monthly from May through October and is one of the most popular. The Indiana Astronomical Society provides information about the night sky and high-powered telescopes that people can use to view the stars. Given McCloud&apos;s location, light pollution is minimal making it a great place to stargaze with the family. Every four months, Hendricks County Parks & Recreation publishes its magazine, The Explorer, which contains listings and descriptions of all of the programming offered at its parks over the coming season. The magazine is free and available at local public libraries and other businesses. You can also pick one up at the McCloud Nature Center. Additionally, The Explorer is available online through the parks department&apos;s website. 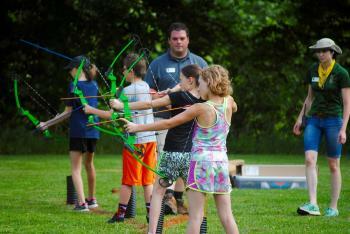 In addition to the family programming, the naturalists at McCloud Nature Park also offer summer nature day camps for kids ages 2 through 14, scouting programs for boys and girls and field trip opportunities for schools and homeschoolers. 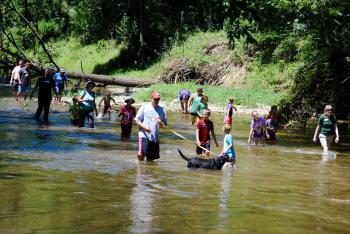 McCloud Nature Park also hosts some popular annual events. Maple Syrup Days take place during the first two Saturdays of March every year, where you can learn how maple syrup has been made throughout history and how it&apos;s made today. You can try your hand at tapping a maple tree, and see how the park naturalists collect sap from the sugar maple trees within the park. Then fill your belly at the pancake breakfast, featuring 100% all-natural McCloud Maple Syrup. 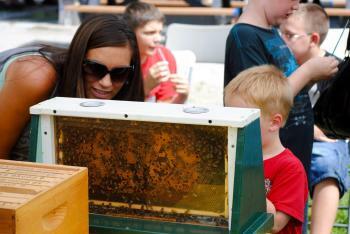 The McCloud Honeybee Fest celebrates pollinators every year in August. Local beekeepers and park naturalists teach the importance of pollinators, how honeybee colonies work and all of the things that we rely on pollinators for. The park&apos;s most popular event every year is the Fall Colors Festival. McCloud Nature Park bursts with gorgeous fall foliage every autumn, so a celebration is held every year in October that includes a wide variety of fun activities for the whole family, including the annual McCloud Prairie Maze. McCloud Nature Park is fun to explore on your own, too, and there are plenty of activities that you can enjoy there. Hike the trails, bring a camera to practice your photography skills, put your canoe or kayak in Big Walnut Creek, do some catch-and-release fishing, have a picnic, wade in the creek, see what animals you can find around the park and much more. Be sure to wear comfortable shoes, dress for the weather and bring a water bottle anytime you&apos;re at the park. Any day is a good day to visit McCloud Nature Park!